Our group arrived safely at Ben Gurion Airport this afternoon, just an hr. and a half or so past schedule. It was dark and raining by the time we got our luggage and boarded our bus. We had a good meal here at the Blue Ray Hotel at Natana. The wind is howling outside my window at present. Natana has been known as the number one city in Israel for artisan diamond cutting. It’s always a good start when all the passengers are well and accounted for, and there is no delayed luggage, so we’re thankful for that. We’re 7 hours ahead of Sweet Home Alabama time. Everyone is tired, but the good meal tonight and hopefully a good night’s rest will recharge everyone’s batteries. Fawzi, Elie and Leon at Natana. Dolye Stogdill, photo. Some of you will recognize our guide and friend Elie, at right and behind me, and Fawzi, our driver. These men are professionals and a pleasure to work with. Tomorrow we head up the coast and then across to Tiberius on the Sea of Galilee. Continue to check in and we’ll post as we can. Thanks to those of you who have written. 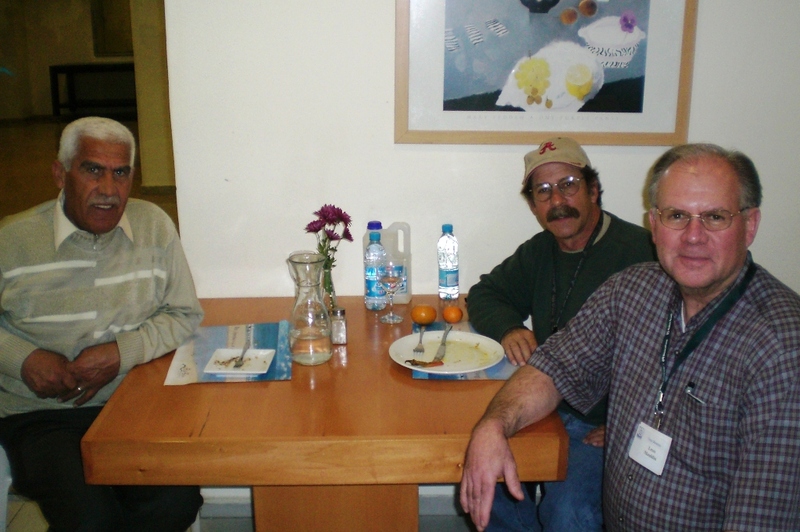 This entry was posted on Wednesday, March 9th, 2011 at 2:11 PM and is filed under Friendship, Israel, Travel. You can follow any responses to this entry through the RSS 2.0 feed. You can leave a response, or trackback from your own site. It is good to hear that you’ve arrived safely. An answer to prayers. I appreciate the time you take to make your post and you can know that I will be reading each one eagerly. Take care. So glad everybody arrived safe and sound…am enjoying pix and blog!! How wonderful that we get to live vicariously through your travels! Give our love to our daughter and son-in-law, Laura and Wes Oliver! Praying for you all to be safe and to have a profitable tour. GLAD TO HEAR YOU ALL MADE IT SAFELY.HAVE A GOOD TRIP!! You look like you made the trip pretty good. I’ll check for your updates. Eagerly await the updates. Hope all continues to go well.